Find Your Confidence & Dare to Shine! Are you a woman who’s faced challenges in life and has lost your confidence? Maybe you’ve never had the confidence you desire? Do you see other women living the life you really want? Is your mind full of self-doubt which stops you doing things? Ready to let go of what’s holding you back? Unshakeable confidence isn’t something we’re born with but, like any other life skill, you can develop and become skilled in it over time…if you know how! Step one to gaining confidence is to dare to believe that in time YOU will have the confidence you want. If you can do this then you are ready to take the next step on your exciting journey. Imagine for a moment that you have a heavy bag on your back – weighing you down, making you feel miserable and stopping you moving forward. It’s exhausting – like trying to walk through treacle isn’t it. Life can be like this – a whole bag of regrets, negative self-talk, not feeling good enough and worries about the future – yes, they are all in that bag on YOUR back! No wonder you don’t have the energy to confidently move forward and try new things. Now’s the time to let go of those things holding you back and dare to be the confident and happy you! I imagine you, like so many other women, have dreams of what you want your life to be like. These could be dreams that you’ve never shared or felt it’s not ‘quite the right time’ due to other life-priorities. You know you’ve created some bad habits that don’t serve you but you don’t know how to break away from them. For too long you’ve struggled on your own. Now it’s time to get the help and support you need and deserve. YOU are so ready to let go of the negative mind chatter stopping you living the life you desire – I’m so excited for you! She Who Dares Shines 1-2-1 is my 12-week, one-to-one, tailored programme where you will learn powerful and empowering techniques to overcome your low self-esteem and provide you with the LASTING self-confidence you’ve always wanted. You dream of being confident but what does that actually mean to you? I’ll help you explore that, it’s your opportunity to be, do and have whatever you choose. My role will be to help you unpack your heavy bag, rid yourself of all those things weighing you down and give you renewed energy and confidence to bring new, exciting and positive things into your life. Clients come to me with a specific challenge or feeling they want to change which I help them solve. What makes ‘She Who Dares Shines 1-2-1’ unique is that it helps you look at all aspects of YOUR life and transform those areas most important to YOU. NOW is the time to get serious about YOU and what you want from life. No-one is going to do it for you! You know you don’t want to stay stuck, you want things to be different but what you need to do is take that first step, because that’s how the journey to the fabulous confident YOU begins! Remember how great it felt when you had a good day, when everything went right, and you felt good about yourself? There are so many things that we have to work on in life; relationships, work, family etc. Our fears, self-doubts and mind chatter can kick in big time and some days can throw us off track completely. Every morning you create a positive mindset habit and step into the fabulous, confident version of you. You are focussed on your goals and confident they can be reached. Yes, there are barriers and things that scare you but these are challenges you can work on and overcome. Your new-found self esteem will drive you forward and you are no longer a prisoner to self-doubt. You will make things happen YOUR way as you take control and start running your life to YOUR agenda. Many women experience what I call “confidence wobble”. For some, low self-esteem and self-doubt are constant companions that relentlessly sabotage their hopes of living a rich and fulfilled life. What if I told that you could develop the skills you need to grow and maintain your confidence in just 12 amazing weeks! As we all know lacking in confidence and low self-esteem can result in you becoming caught in an ever-decreasing spiral of anxiety – I know, I’ve been there too. But, to break out of this repeating pattern YOU need to step-up and take positive action. This can feel like a very daunting ask but this is exactly where I can help you. Just like you I’ve faced my own life challenges caused by self-doubt, lack of confidence and negative mind chatter. However, I learnt how to overcome these and push myself to go well beyond my comfort zone. I’ve definitely felt the fear of doing that – but these experiences are the building blocks for growing confidence and self-belief. What I ABSOLUTELY know is this… when you behave with confidence you draw positive things to you and become more attractive to people, both personally and professionally – yes really! I’ve had many amazing experiences in my own life because I was open to challenging my own limiting beliefs, mind chatter and stepping outside my comfort zone and feeling the joy of doing something I previously feared! Many of my clients have experienced life changing moments due to our work together. I consider it a real privilege to be part of their journey and I love to watch my clients grow in confidence as they progress towards achieving their goals and dreams! Imagine what life will look like if you have the confidence you desire? What new things would you do? What dream would you go for? So, you have a choice RIGHT NOW…You can either stay stuck, plodding along on your own, thinking ‘if only” – and be in exactly the same place this time next year OR you can take action TODAY to begin to create the life you want to live. If you are ready to retake control of your life then you are going to love my new programme created especially for women like you. I will show you how to build your self-esteem, develop unshakable confidence, find your focus and achieve things you never thought possible. With more confidence you will become happier, at peace with yourself and draw the right people and experiences to you! So – What does the ‘She Who Dares Shines 1-2-1’ programme look like? ‘She Who Dares Shines 1-2-1’ is totally focussed on providing women like you with proven, confidence empowering materials – all packed into a transformational 12-week, one-to-one programme. I can’t wait to share it with you! Over the years I’ve helped hundreds of people to overcome limiting beliefs, silence the mind chatter, create a positive mindset, develop their confidence & self-esteem and achieve things they never thought possible – and I’m going to take you on this powerful, life-changing journey too! I’m going to be teaching you lots of new techniques for developing your confidence, boosting your self-esteem and getting your life back on track! You will receive practical, powerful tools to banish your fears, stop the negative mind chatter, embrace change and develop unshakable confidence. All of this is combined with activities that ensure you put into action everything you have learnt. These activities are designed to reinforce your learning, gently but consistently helping you to embed your new skills into your everyday life and witness the positive changes that result. This is all about forever banishing your ‘Mindset Monkeys’, those naughty little blighters that keep you stuck where you are. Together we will clear your mind of self-sabotaging thoughts and refocus your energy on the important things you can change or influence. I’m going to release you from all that exhausting, negative, mind chatter and give you the freedom to make better life choices. You’ll be going on an exciting journey of self-discovery; identifying and learning what you genuinely desire. Together we will begin to reveal the confident you and start to explore lots of new possibilities…all grounded in your ever-growing sense of self-confidence. We will be spending time looking at your self-care and I’ll be supporting you to create your personal self-care plan. Part of your self discovery journey will be to retrain your negative mind chatter into positive thoughts. This is where everything you’ve learnt comes together! I’m going to empower you to take those actions necessary to create your ideal life and change what were once just dreams into your new reality. With your new-found self-belief you will be able to focus on precisely where you want to take YOUR life and how you will go about it. And – to help you cope with the inevitability of life’s ups and downs I’ll be teaching you strategies to shake off any set-backs, recognise and celebrate the progress you’ve made and refocus on the goals ahead. On completing the ‘She Who Dares Shines 1-2-1’ programme you’ll possess a hugely valuable set of tools that you can use for the rest of your life…a fantastic investment in YOU that will pay for itself over and over again. A thought-provoking ‘She Who Dares Shines’ Discovery Questionnaire to identify your starting point and what you want to achieve. Life map exercise to define where you are in all aspects of your life and measure your progress along the way. If you sign up before the 31st March you will also gain access to the ‘She Who Dares Shines’ group programme, with these additional benefits! Worth £499! For each topic I’ll provide you with a range of powerful tools and strategies to choose from. I’ve always wanted to create a programme like this, one that provides valuable and powerful tools that are specifically tailored for women. I’ve been where you are right now! I’ve felt the desperation of knowing you want things to be different but you don’t know how. I knew that in order to bring about change within my own life I had to take action – but it felt so scary to do it on my own. I wished I’d had something like ‘She Who Dares Shines 1-2-1’ when I was going through my own journey. To motivate and encourage you to feel you can do this, to hold your hand when things get a tad scary and to celebrate with you with every positive step you take towards being the confident and happy you…sounds good? Feel empowered to be YOU! So, are you ready to live the confident life you are meant to live? Are you ready to Dare to Shine? Invest NOW to get all this amazing support to become the confident and Happy YOU through the ‘She Who Dares Shines 1-2-1’ programme for just £997. This is a special launch price – This offer price will end on 31st March 2019. The usual price of £1,997 will then apply. So grab this launch-offer saving worth £1000 TODAY! Secure your place on this life-changing programme by clicking below and let the magic begin! 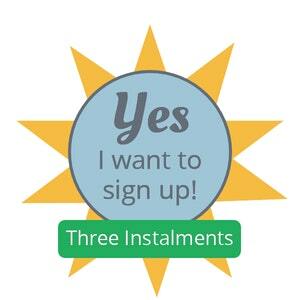 You can pay in three instalments of £360 per month. Just click below and let the magic begin! 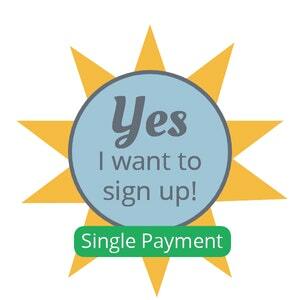 NEXT STEP: Once you have signed up you’ll be sent a welcome email explaining how the programme will work. Congratulations on Daring to Shine!